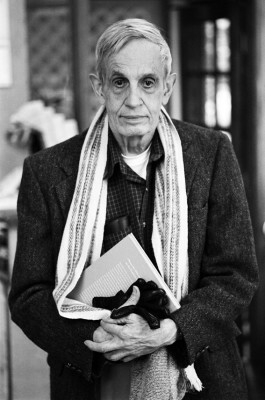 John Forbes Nash, Jr., the mathematician famous for his work in game theory all while battling paranoid schizophrenia, was killed in a car crash over the holiday weekend with his wife, Alicia. Nash’s story was made famous by the 2001 Oscar-winning film, A Beautiful Mind, which starred Russell Crowe as the mentally ill but incredibly brilliant Princeton University mathematician. According to reports, Nash, 86, and his wife, 82, were traveling in a taxi cab in Monroe Township, New Jersey, when the driver, Tarek Girgis, lost control while trying to pass another car. The cab hit a guard rail, and Nash and his wife, who were not wearing seatbelts, were ejected from the vehicle and pronounced dead at the scene. Girgis was taken to a hospital, though his injuries were not life-threatening. An investigation is currently in operation, though no charges have been filed. While A Beautiful Mind is entertaining to watch, it is not an accurate depiction of John Nash’s actual life and work. It left out key moments from Nash’s life, such as John’s and Alicia’s divorce in the 1960s and John’s child from a previous relationship. It also manipulated facts, such as the character’s dependence upon drugs for mental illness; the real Nash stopped relying on medication decades ago. A more accurate telling of Nash’s life can be found in the biography of the same name, A Beautiful Mind, which was written by Sylvia Nasar in 1998. News of the couple’s death drew tributes both from his academic colleagues and those involved in the film based on his life. Russell Crowe and film director Ron Howard also expressed their grief on social media. Police have not stated, but it is likely that Nash and his wife would have survived had they been wearing seatbelts.